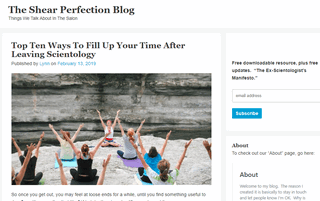 A blog about the happenings in the East Hollywood neighborhood of Los Angeles, which just happens to include the Western United States regional headquarters of Scientology. The author is an ex-Scientologist, who was a member for over 40 years. Consequently, she has in-depth insight into their practices and abuses. She is a working cosmetologist and a free speech activist. Her salon is located a block away from their organization.